Finland was Nazi Germany’s co-belligerent in WW2* as being attacked by the Soviet Union in 1939, but only received limited assistance, first from the West (France and UK) and up to 1944, from Germany. Finland was the only European country bordering the Soviet Union and still unoccupied by 1945. According to Finnish records 19,085 Soviet POW died in Finnish prison camps during the Continuation War, (29.6% of Soviet POWs), due to malnutrition and diseases. Finland was never a member of the Axis powers, retaining a democratic and non-discriminating policy for the duration of the war, and never signed the Tripartite Pact although taking part of Operation Barbarossa 1941, and fighting to the separate peace with the Soviet Union in 1944. By 1945, the picture was grim. The war had caused great damage to the infrastructure and the economy. Mine clearance operations started in autumn of 1944, in Karelia, Lapland and the Gulf of Finland, and lasted until 1950. Those remaining cause lots of casualties, sometimes long after the war. As part of the Paris Peace Treaty, Finland was classified as an ally of Nazi Germany and was imposed heavy war reparations, including the lease of the Porkkala area near Helsinki for fifty years. The reparations were later reduced by 25% by the Soviet Union in 1948, but paid off anyway in 1952. Eventually, Porkkala was returned to Finnish control in 1956. One term is frequently used to describe the Cold War early years: “Finlandization”. The country was heavily influenced by the Soviet Union, but remains the only country on the Soviet pre-World War II border to retain democracy and a market economy. Finland joined the Agreement of Friendship, Cooperation, and Mutual Assistance (YYA Treaty), ensuring neutrality. As a consequence, Arms purchases were balanced between East and West until the fall of the Soviet Union, although by virtue of cost and proximity, Soviet hardware was preferred. In general, various industries benefited from trade privileges with the Soviets, in addition to Western economic relations, which led to an economic boost. By 1975 Finland’s GDP per capita was the 15th highest in the world, and by the 1980s, set up an extensive welfare state policy. T-26 m1937 and T-26 m1939, T-26E, T26T (until 1959), T-38-34s (until 1959), T-38-KV, T-20 Komsomolets, T-28 m1938/T-28E (until 1950), locally modified BT-42 (until 1956), KV-1 (1954), ISU-152V (1959), Panzerkampfwagen IV Ausf. J, Sturmgeschütz 40K and Sturmgeschütz III Ausf. G (until 1966), Landsverk Anti II (until 1959). The Finns also operated the British Charioteer Mk VII Model B for most of the Cold War: 38 were obtained in 1958, which served until 1980. The Comet Mk I Model B was also briefly used (1960 to 1971), 41 second-hand being pressed into service. However, the 1960s saw the adoption of the T-55, of which 74 were operated (including 10 T-55K), from 1966. These were modernized in 1989: T-55M (70 units) and 4 T-55MK. 157 T-72M1, 3 T-72M1K and 2 T-72M1K1. PT-76 were obtained in 1963 and maintained in service until 1994 (12 units) for recce units. Some have been converted as PT-A (driver training tanks) after decommission. 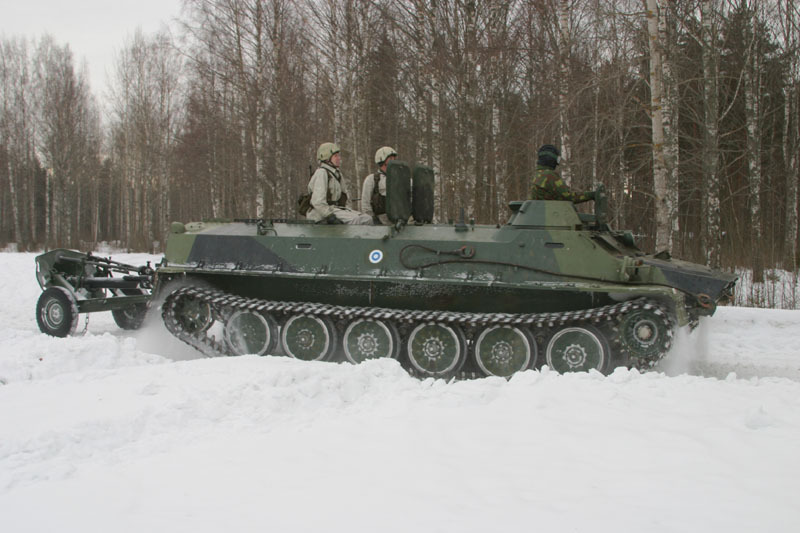 With its low-profile and dependable characteristics, the Soviet-era MT-LB still forms the bulk of Finnish tracked APC force (about 400 in service). Until the late 1980s, the Finnish Army relied heavily on Soviet-built hardware, however following many other European countries, Finland bolstered its capabilities with the adoption of the German-built Leopard 1 (1A4) in the 1980s. Finland bought 124 Leopard 2A4s from surplus German stocks in 2003. 12 were later converted into bridge-laying and CEV tanks, 12 more being disassembled for spares, leaving 100 operational tanks. In 2009, the Finnish Army bought 15 more German surplus Leopard 2A4s for spare parts (total 139). On 16 January 2014, Finland agreed with the Netherlands to purchase 100 Leopard 2A6NL for approximately €200 million. In 2015, most of the 2A4s were moved into reserve (7 converted into Marksman SPAAGs and mine clearing tanks). According to Turkish news sources, Finland was initially interested in getting the Turkish upgrade package to modernize their fleet of Leopard 2A4s. In addition, 40 used Leopard 2A6 tanks will be delivered from the Netherlands 2018-2019. This will bring the Finnish main battle tank force to 200, not a negligible force to consider, with the addition of about 140 reserve Leopard 2A4 that still can be modernized. Structure: The Maavoimat comprised the infantry (which includes armored units), field artillery, anti-aircraft artillery, engineers, signals, and supply troops. Since ww2, the Finnish Land army has been in peacetime training formation, meaning its brigades (joukko-osasto) are only training formations. They train each batch of conscripts they receive for a specific war-time unit. Conscripts are then demobilized and placed into reserve. There are regular “refresher exercises” for the reserve unit, which also includes tank and AFVs crews, on a per-unit base. The bulk of the APC force is split between a variety of tracked ones (Soviet era MT-LB) but also articulated (Swedish and local) types, and locally-built wheeled APC of the AMV and Sisu types. The 6×6 Sisu Pasi is rather an old vehicle (devised in 1980 with some Western influence) and recalls the German TPZ Fuchs in many ways. It has been also rightly compared to the BTR-80. Largely produced for local needs and exported, the Pasi saw action in Afghanistan, Bosnia, Croatia, Eritrea, Golan Heights, Iraq, Kosovo, Lebanon, Macedonia, Namibia, Liberia, Somalia and Chad. The 8×8 Patria AMV, also devised for export, is going to replace it in the years 2020-2030. The Patria gets a highly modular design, allowing many almost on-the-field modifications. Its characteristics were duly noted and the South African Badger is based on it. There is also a LAV-25 replacement project for the US Marines that gave the Havoc MPC, the fruit of an agreement between Patria and Lockheed Martin. The Polish Army has ordered no less 690 vehicles in 2003. It was locally known as the KTO Rosomak and had been since largely used in combat (Afghanistan). Other customers for the Patria includes Slovenia, Croatia, the UAE and Sweden. This is Finland’s success APC and worthy successor of the Swiss Mowag Piranha in this area. Leopard 2A4 MBT. The Finnish Army operates 100 of these, alongside 60 Leopard 2A6s (about 100 in the near future). There are still a handful of Polish-modified T-55M used for mine-clearance, equipped with a bulldozer blade or KMT-5 mine rollers. 102 CV-9030 FIN: These top-notch Swedish built IFVs (on Finnish Specs) are in service today, and were delivered two folds: 57 first batch, 45 second batch. 110 BMP-2 (delivered in the 1980s) are currently updated (ongoing process ending in 2019) with thermal imaging and Polish multi-spectral camouflage Berberys-R.
Soviet-built MTLBs makes the mainstay of the tracked APC force: 389 are currently in service. Patria AMV XA-360: These locally-built recent wheeled IFVs are given the Protector (RWS) remote weapon station for urban combat. 62 currently in service as of 2016. Sisu Pasi XA-180/185/202/203 OWS wheeled APCs: Also built in Finland, about 409 in service, since the 1980s (some are modernized since 2014 and up to 2017, others are to be modernized until 2019 (next batch). Sisu NA-110 Tracked articulated APC. In addition to 250 of these, about 20 BV308 and 400 Swedish-built BV206 D6N are also in service. Leopard 2L, 2R, BLG-60M2 AVLBs, Sisu E15TP Leguan and Sisu RA-140 DS specialized tanks. Motorized artillery: 122 PSH 74 self-propelled howitzers, 72 Soviet-built vehicles, and in addition to 34 298 RSRAKH 06 MLRs and 34 122 RAKH 89 M1 (Czech built 6×6) MLRs. ITPSV Leopard 2 MARKSMAN SPAAGs. awesome pictures. I am interested in the true Finnish tanks from pre ww1 to ww2. any information will be helpful to me. Cheers Billy. Unfortunately, Finland did not develop tanks during the interwar or WWII, save for the T-26E and BT-42. Its actually Naaras(female), not neiraas. The classification was similar to the Brits as Male(koiras) tanks had guns and Female(naaras( tanks had MG’s. 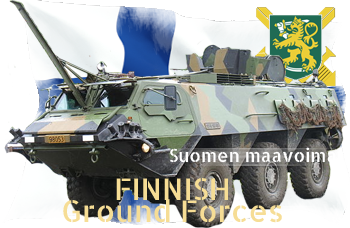 Also can anyone tell me the names of the colours used in the Finnish three-tone summer camo? And some more info on the Finnish FT-17s: They were first armed with standard French Hochkiss MG’s, when those were expended they were replaced in 1932 by Finnish 7.62 mm Lahti-Saloranta(the surnames of the creators) pikakivääri(=”rapid rifle”, in Finland a LMG that isnt fed from a belt is called this) with drum magazines(not usual 20-round versions). In 1937, these were in turn replaced by Maxim MGs(7.62mm). I am confused of the Male tank’s armament, they all seem to have a short Puteaux 37mm, instead of the surviving example at Parola Tank museum. It has a longer version, just like your illustration. There were 19 female FTs and 15 males, not 18 and 14. unless my source speaks of a different year. 4 FTs were kept in service until 1942. And the StuG III: It was known to the Finns as Stu 40 G(officially, while “sturmi” was a nicname). All Finnish StuGs were Ausf Gs, however there were two types of mantlets. The MG-34 was replaced by a DT “Emma” MG. In addition to the logs, concrete was also used as protection, though it offered little protection and reduced speed. The T-50 was referred to as “Pikku Sotka(little Goldeneye(the bird)), the T-34 as “Sotka”, the T-34-85 as “Pitkäputkinen sotka”(long barreled Goldeneye), the KV-1 as the “Klimi”(referring to Klimenti Voroshilov) and the T-26 as “Viku”(referring to Vickers). The KV-1 model 1940 was designated as KV-1B in Finland, while the model 1942 was designated KV-1C.